The Fresh from the Farmers Market crew spent Sunday on the farm. 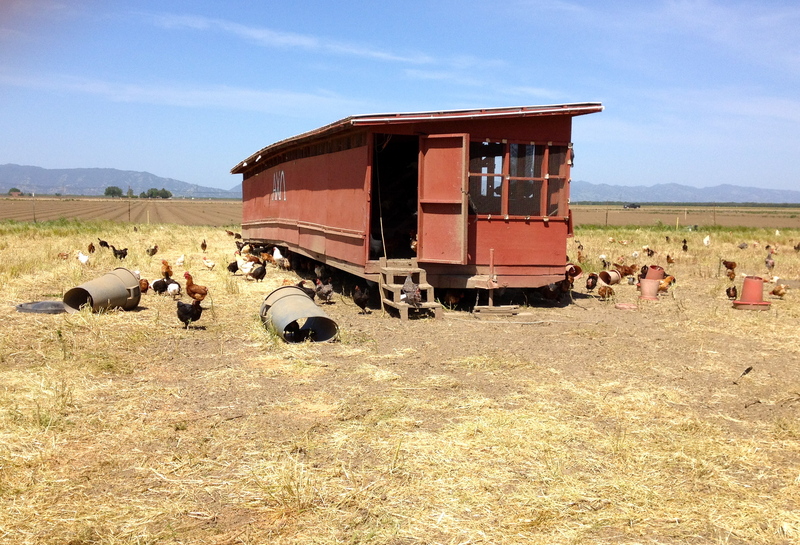 Or two farms, to be exact – Eatwell Farm and Capay Organic. Both are just outside of Davis, CA in the heart of the Sacramento Valley. 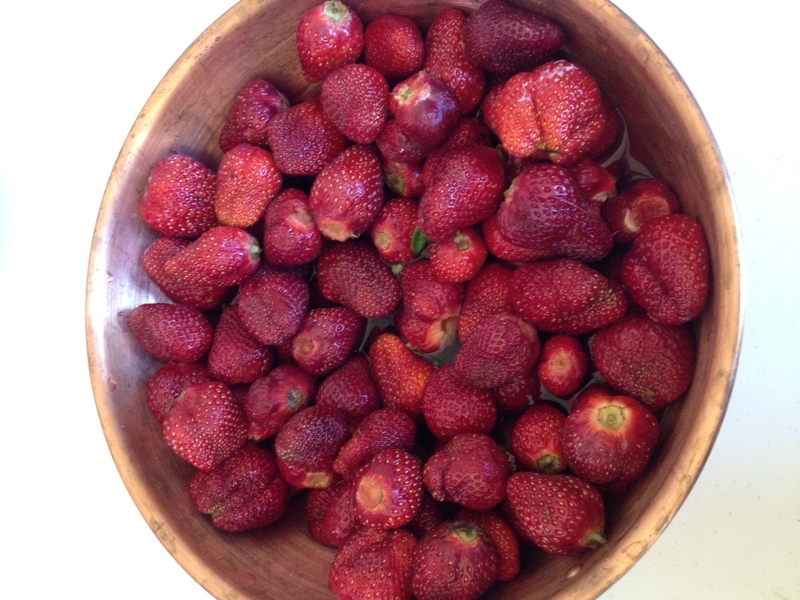 There wasn’t much of a time window between tossing back tequila shots to celebrate Cinco de Mayo and finding myself at the breakfast table with Nigel Walker and his lovely family on Eatwell Farm, with a colossal copper bowl of fresh-picked strawberries as our centerpiece. We spoke about the allure of strawberries and Strawberry Days, the trials of one family living in a school bus while they built their new home from the ground up, and how to best focus this particular egg-themed episode. The crew walked around the farm and said hello to the baby chicks while the Walkers finished up breakfast, then Nigel’s twin boys led the way to the pasture where the hens currently reside. Hens: They are pasture-raised. (Sounds a lot like “pasteurized” when I say it, which is not what I’m going for!) This means they have hen houses for shelter and they go in and out as they please. They are not debeaked like most commercial layers and have 20 acres of land to scratch and peck each year. Eggs: Test results on eggs raised on pasture show less cholesterol and much higher levels of Omega-3 fatty acids. These eggs don’t sit in a grocery store for weeks or months on end, so they are fresher and far more flavorful. Yes, pasture-raised eggs are significantly more expensive than supermarket eggs (free-range included), but there are very good reasons for it. They are fed an all-organic diet of champions and it is expensive. And, they are not kept in temperature-regulated hen houses which virtually guarantees they’ll produce 6 eggs each week. Instead, these hens produce about 4 eggs each week, but they are out roaming the pasture, pecking around, and doing exactly what they were born to do. Happy hens laying happy eggs. Before we left Eatwell for Capay, Nigel spoke about his ingenious composting methods (content for an entirely different episode) and his love of the land, then he ushered us into his cool egg storage locker and gave us each a dozen eggs to take home. Happy eggs and a happy Happelsauce. I won’t delve into the details of our Capay Organic visit yet. Our shoot there was for another episode that doesn’t involve hens or eggs, so I’ll write more on it later. I will say it was equally as educational and interesting a visit as Eatwell. 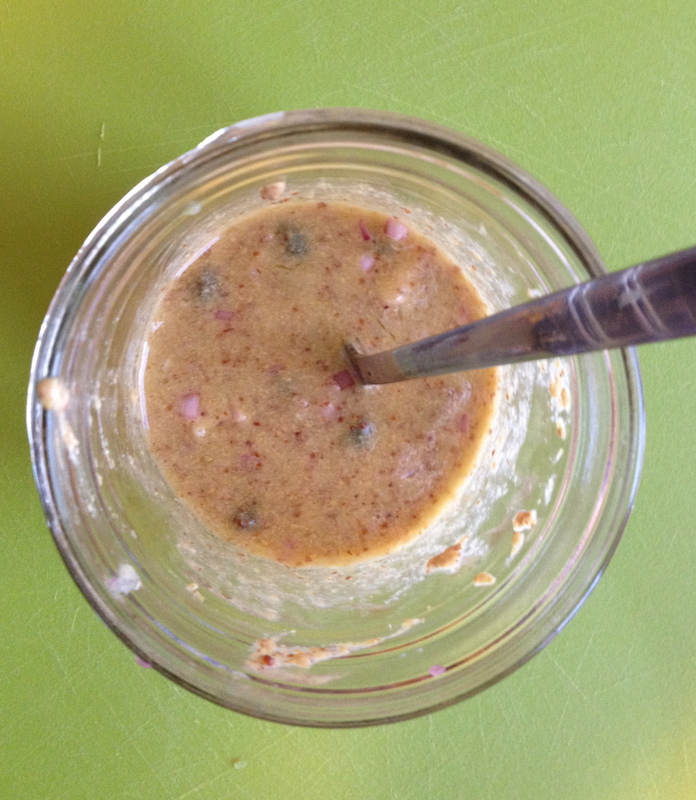 Plus a late-summer recipe was divulged that makes my mouth water just thinking about it. I promise it will be shared. So, how could I do the incredible Eatwell eggs justice? 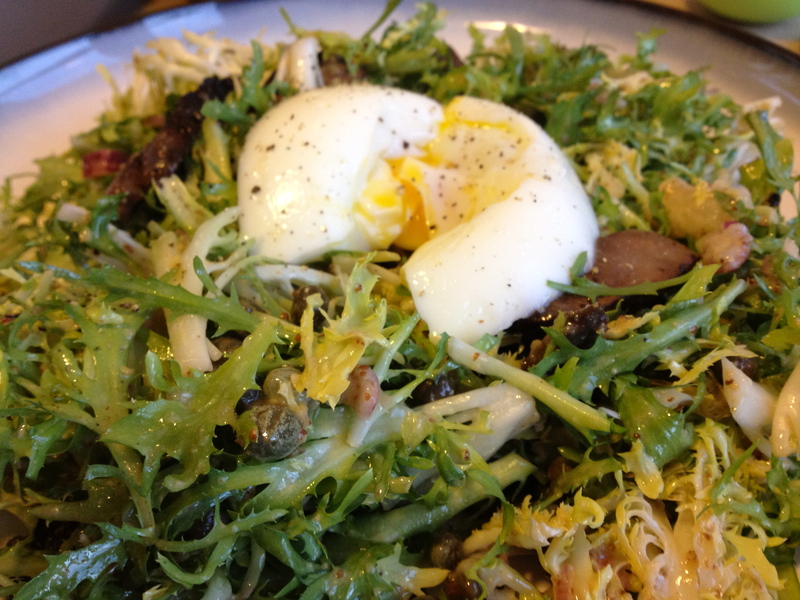 I wanted to really taste the egg, so I decided to make a simple salad and toss it with a much buzzed-about, tangy lemon caper dressing from April Bloomfield of The Spotted Pig, then poach an egg and place it on top. I will say, everything about the salad was truly egg-ceptional. This is eggs-actly what you want in a salad. No egg-ceptions, it was delicious! Okay…I’m done. Now it’s your turn to try it. Chop frisée into bite-size pieces and put in a large bowl. In a skillet, heat a drizzle of olive oil and cook Portobello mushrooms with a bit of salt and pepper over moderate heat, stirring occasionally, until juicy and dark, then remove skillet from heat. While the mushrooms are sautéing, you can make the dressing. Squeeze the juice from the lemons into a jar. Pull the pith from the rind, coarsely chop, and add to the bowl with the lemon juice. Divide salad onto 2 plates and top with warm poached eggs. Season eggs with salt and pepper and serve immediately with warm, crusty bread.